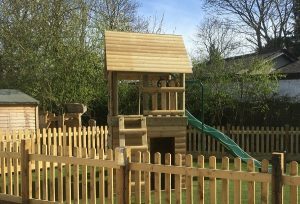 This compact wooden play tower ticks all the boxes for fun and will look great in any garden. Ideal for customers with smaller gardens, as well as those who prefer a frame, to satisfy all their imaginative play needs. There are so many fun things to do, or ‘fully loaded’ as we call it. 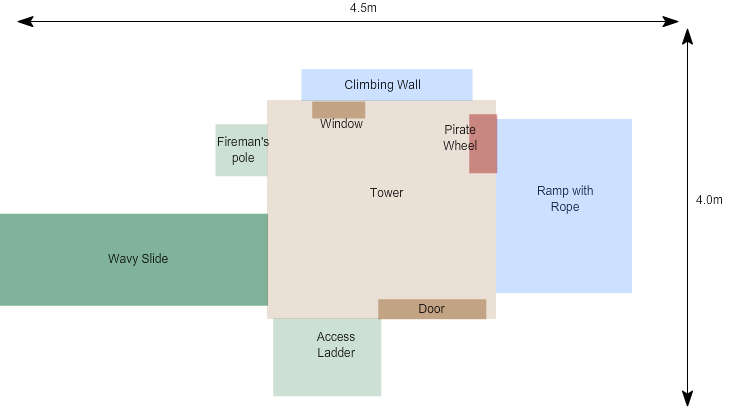 Access is via the ladder or for the more adventurous, its up the climbing wall you go. With a fireman’s pole, you can choose to slide to the ground and play at ‘Firemen’. Escaping from the tower is to go the same way you came or for added fun, take the wavy slide back down to terra firma. Cladding at the bottom of this wooden play tower, creates a secret shelter for imaginative play. Here your children can peek or wave out of the small window, whilst playing make believe to their heart’s content. It will be a hive of activity and entertainment. These frames are built using sturdy round timbers of a very high quality and pressure treated for additional longevity. These frames will provide fun and play for many, many years and are suitable for children of all ages.